Finding Support: Who Listens to Your Song? It is a rather dreary morning here in Denver—grey skies with a chance of rain throughout the day. So, a perfect day to be quiet and to listen to the world around me. Listening. Such a simple, yet profoundly difficult, act of being. To listen requires intentional attention—no distractions, no multitasking. In this day and time, that is a tall order indeed, right? Technology distracts. Careers demand. Family and friends divert our attention. It’s hard to find the time to listen! Consequently, discovering a willing listener in life is a blessing indeed! Recently, a melodious bird reminded me that we all need someone to listen to our song. Recently, the plaintive song of a sweet bird in the backyard serves as my alarm clock. He starts singing around 3:30 a.m. (an early riser to say the least!). The little guy sings his heart out until mid-morning. The same song, over and over and over! Sitting on my porch and sipping coffee, I attempt to understand the song of my feathered friend. Initially, his song seemed to be a lament—conveying his grief over the loss of his mate perhaps. Then I wondered if he was merely working overtime to attract a mate for the Spring season. But today, I choose to hear the morning arias as songs of joy and thanksgiving. Although I will never know the impetus for the songs, I can honor and support the little guy by listening to his song every morning. By so doing, I acknowledge his presence in the world. I validate his worthiness. This may sound a bit trivial—listening to the song of a little bird. However, the experience of being heard is far from trivial. As human beings, we long to be heard. Hence, we need someone to HEAR us. We need listeners in our lives. Listeners who will rejoice with us. Grieve with us. Honor us. Hold us. And bear witness to our journey. We need someone who cares enough to take the time to listen to our song! No doubt, the morning serenade touches me deeply due to the recent death of my brother. Like the little bird, I am compelled to sing my song—to put words to my sorrow. Thankfully, I am blessed to have many, willing listeners in my life—people who resist the temptation to “fix” me and who are courageous enough to be present to my pain. These are also the people who will ultimately savor my songs of joy as I move through and beyond my acute sadness. We need listeners for all seasons of the soul—people who will tune into our songs and occasionally hum in the background! Singing into a vacuum accomplishes little if anything. We are wise to seek out a receptive audience, take a deep breath, and belt out our song. 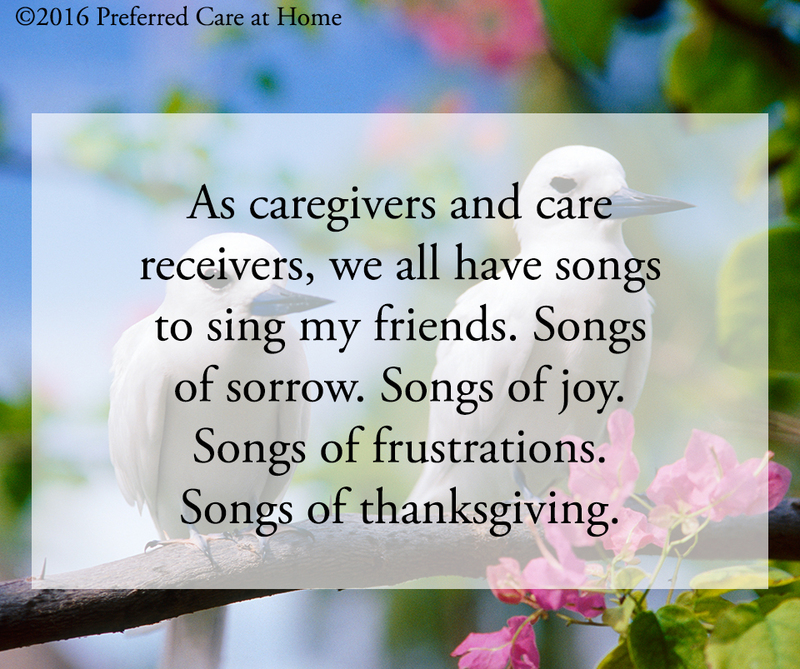 As caregivers and care receivers, we all have songs to sing my friends. Songs of sorrow. Songs of joy. Songs of frustrations. Songs of thanksgiving. Sending out the message—singing your song—is one part of the process. Having someone receive the message—listening to your song—completes the process. So, who listens to your song? A question worthy of consideration.